Gretchen Rubin says people tend to be either Openers or Finishers, and at least when it comes to craft projects, my work-in-progress basket(/box/entire spare room) attests to the fact that I am a bona fide Opener. I can even set projects aside when they’re extremely close to done, if the allure of the shiny new thing is strong enough. Today I thought I’d take a tour through just a small selection from my half-made pile, and hopefully inspire (or is that shame?!) myself into becoming more of a crafty Finisher. 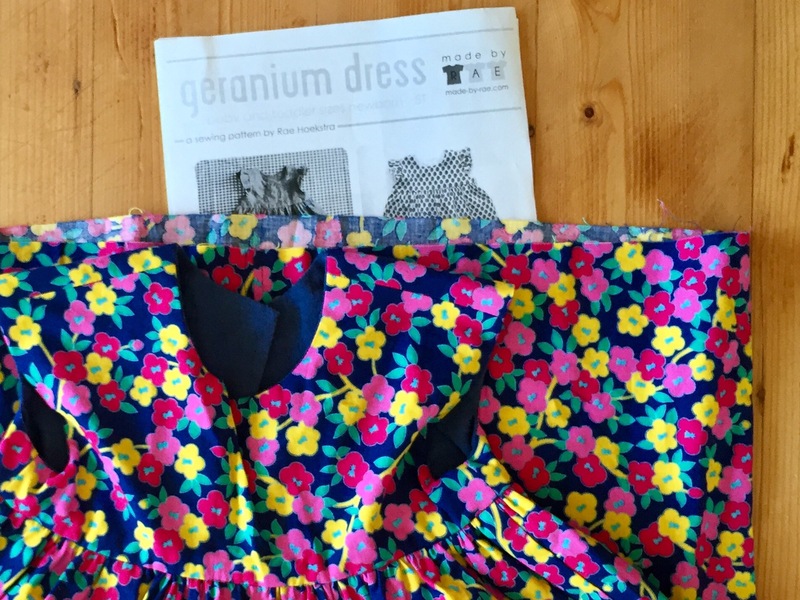 A Geranium Dress which I cut out in a size 4 for my older daughter, who is almost certainly now a size 5. So this is a bit sad, since she was excited about choosing the fabric and everything. I got up to the point of adding buttons, lost my nerve, bought some snaps, and have since not managed to find the time to read the instructions and learn how to insert them. A Sally Romper in a size 3 for my other daughter. I love these toucans so much, and I think she is almost definitely not going to fit this one. She’s been growing faster than I can keep up. I’ll try not to feel bad – I know quite a lot of other little girls who are coming up to size 3 – and just call it a learning experience instead. A little Liberty Pretty Zippy pouch I was planning to give my mother as part of her Christmas present – I thought it would be perfect for her crochet hooks or some knitting bits and pieces. Luckily birthdays always follow Christmas, hey?? I don’t know what happened here. I think my sewing session got interrupted, as they often do, and I never went back to finish the last few seams off. A Chopsticks Quilt top, 80% pieced. My first “real” (traditionally pieced) quilt top. 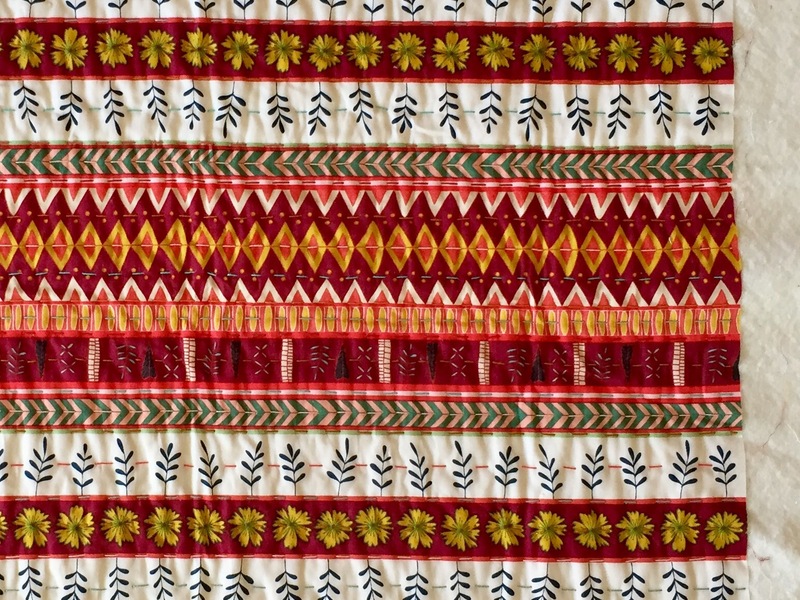 I was working away at it very happily until the owner of my local quilt shop told me I wouldn’t be able to machine quilt it with the backing fabric I had picked out (one of Anna Maria Horner’s yarn-dyed Loominous range), at least not on my home machine as I had been intending. I don’t know if she’s right, but either way it dampened my enthusiasm for the project. I bought 3.5m of the fabric I wanted anyway, because don’t tell me what to do, and because hey, what would she know about quilting (other than possibly way, way more than me). It doesn’t strike me as a very hand-quilty project, but I guess I could always hand quilt it if I needed to. This hand quilting panel I made for a cushion is finished (yes!) and just needs to be sewn up into a cushion cover now. I’ll also need to sew my own cushion insert, as I made it a random size. 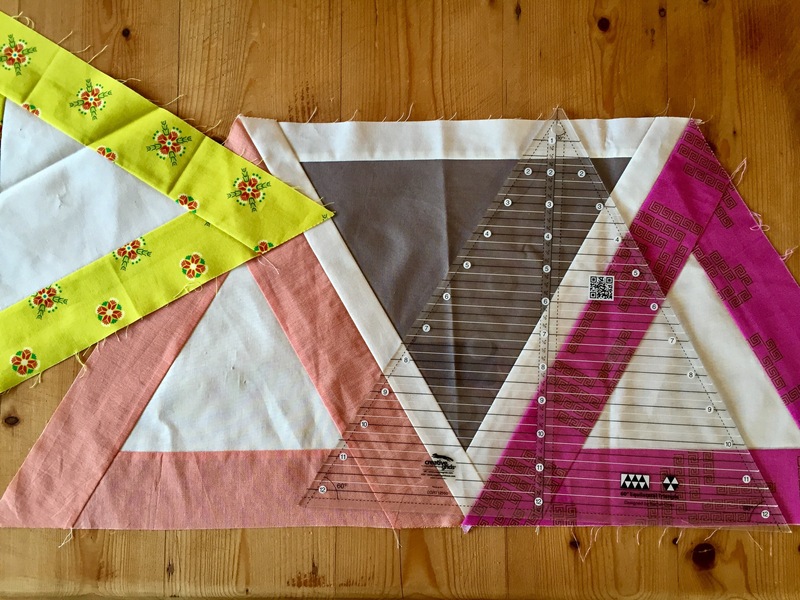 I have more to say about what I learned about hand quilting through this project (including the wisdom, or otherwise, of my fabric choice), but I’ll save it for another time. Speaking of inserts, this beautiful velvet cushion cover I bought in Paris is an odd (long) shape and has also been waiting quite a while for its own cushion insert. I would love to put this on my couch, so I should get moving. You know what’s holding me up on these cushion inserts? 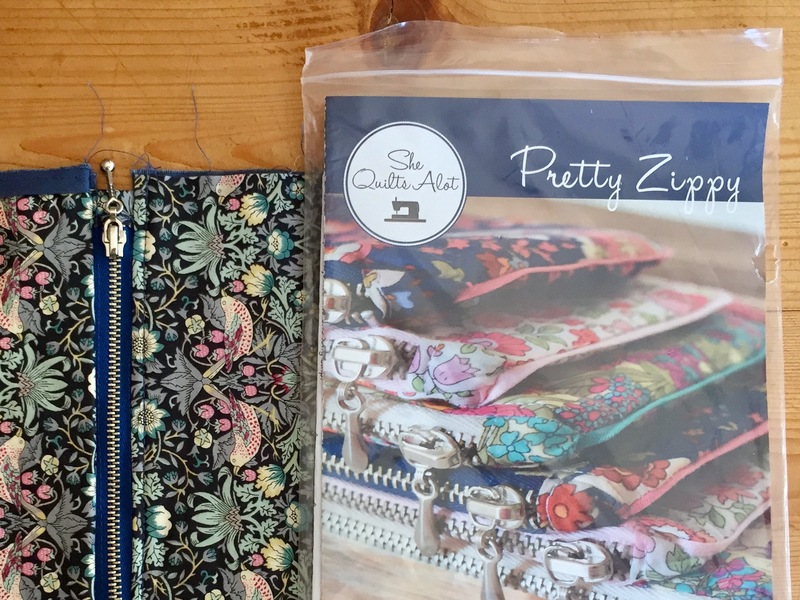 The Dreaded Zippers. Even if I know (low stakes) practice is good for me. 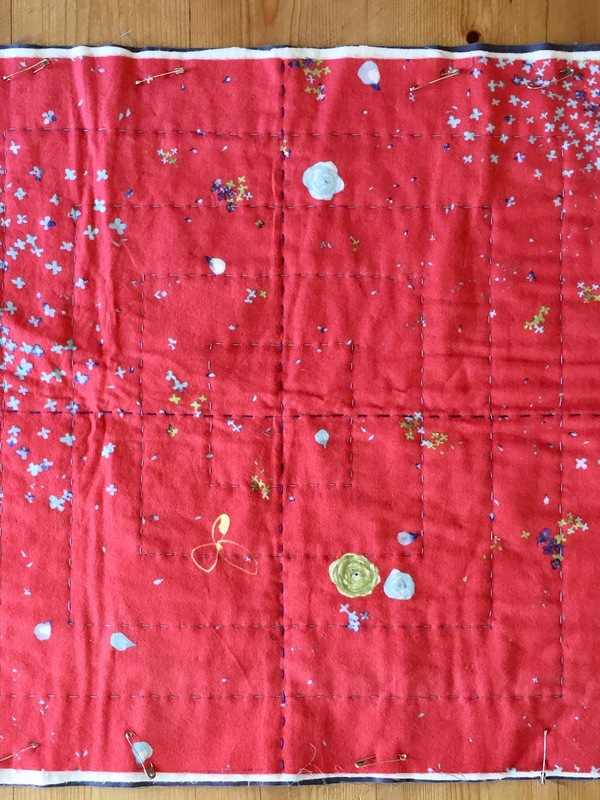 My second hand quilting project, a pillow top panel I started in Lauriston in my class with Felicia Semple, which seems years ago now. I’m just making this one up as I go along, and I’ve decided the quilting needs to be denser, spaced at 1 inch intervals rather than 2 as it is at the moment. So there’s more handwork to do here before this one can fulfil its pillowy destiny. I have been wanting a dedicated tote bag for carrying fabric or yarn or other things that shouldn’t get dirty. If I’m taking supplies to a class, for example, or if I should happen to purchase something from a fabric store. For example. The pattern in this book looks like a good one to start with. I think possibly it’s too big for what I want, but I’ll give it a go anyway, and make a smaller one if I like how the pattern works out. 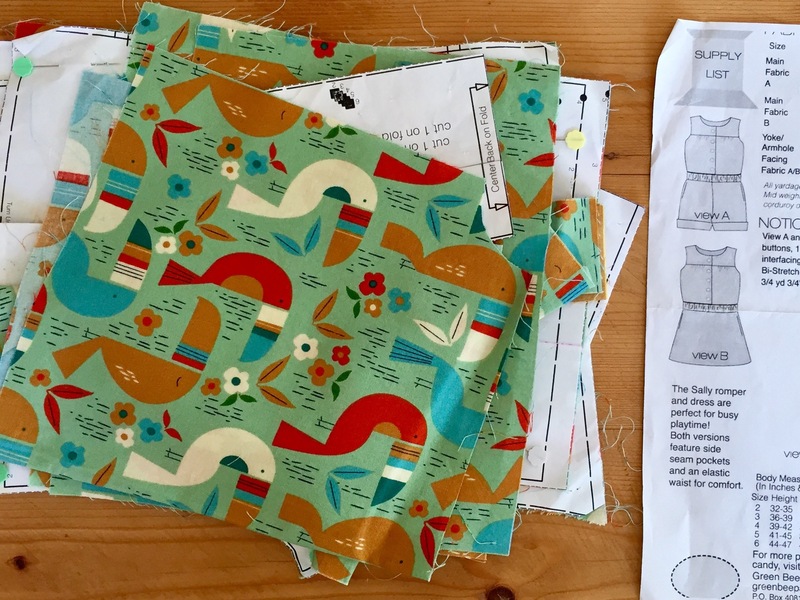 I’ve cut it out already, with the dotted cotton/linen fabric for the outside and yet more Anna Maria Horner for the lining. 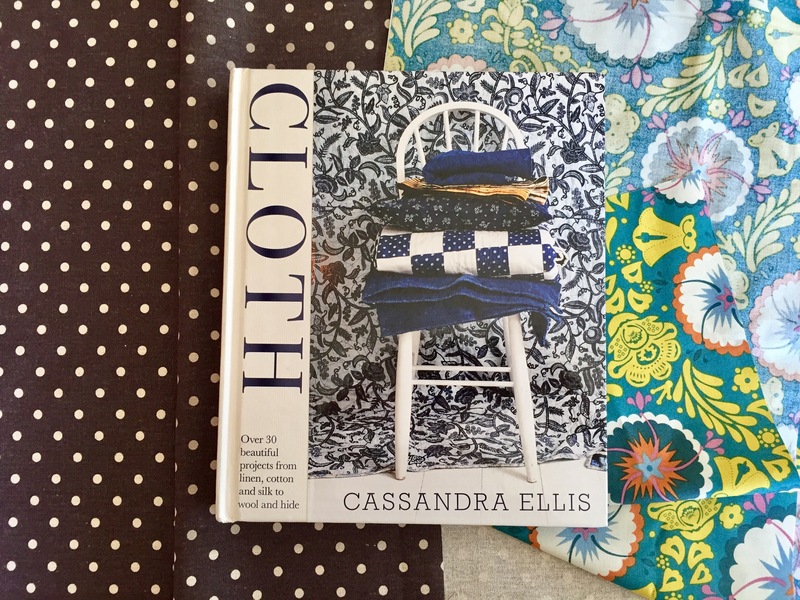 I love this teal fabric – it reminds me of book endpapers. 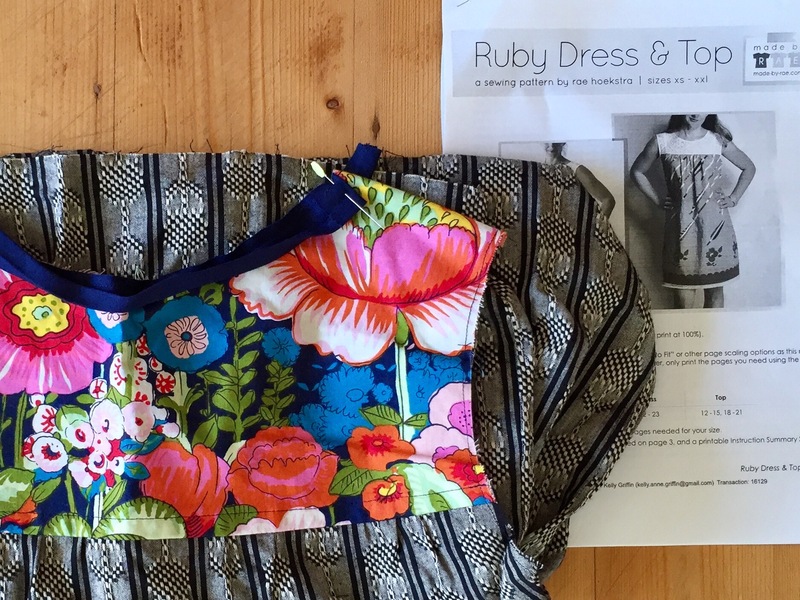 On this Ruby dress I got doubly discouraged: the binding was driving me nuts (what else is new), and I fell pregnant and changed shape. 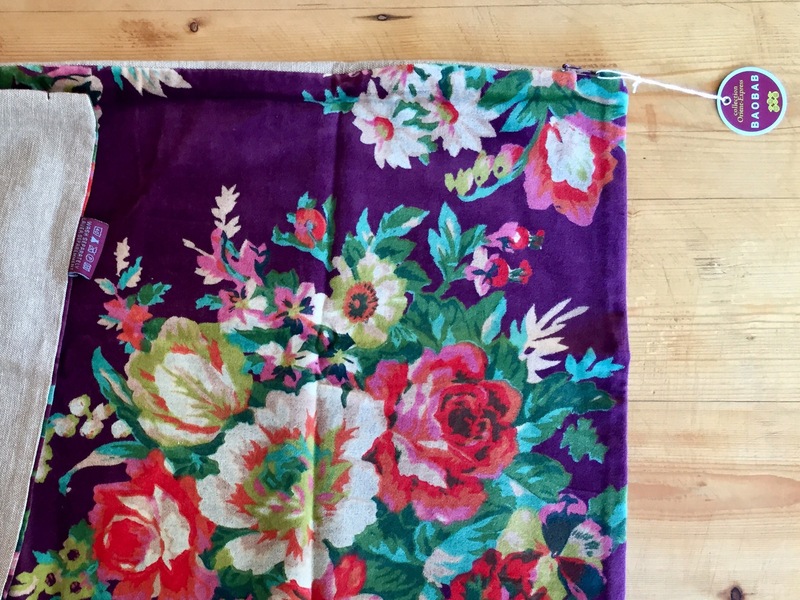 Somehow I just KNEW that would happen if I branched out into garment sewing… Anyway, I do love how this was going – I was so pleased to find a way to feature this beautiful Flores de Coyoacán fabric, which I only had a fat quarter of. So I should definitely finish this off, and then I can look forward to wearing it when I’m back to normalish shape. Apart from these there’s also the knitting pile (of course) which has been hibernating since last winter. And there’s STILL this crochet blanket (of course), which I don’t really want to talk about. 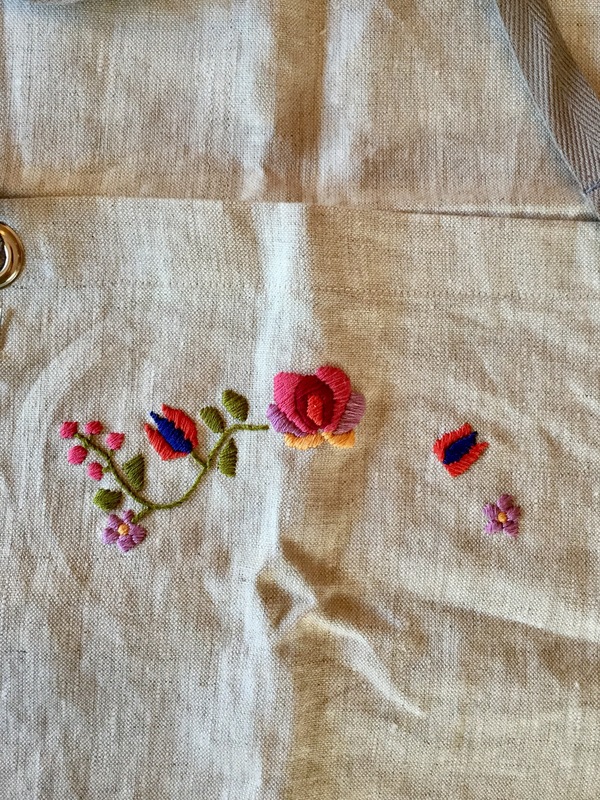 Plus there are (of course) cross stitch and embroidery and tapestry type things mid-progress too, but I don’t worry about them as I find they operate on a different time frame. Kind of like ice ages. Anyway, after several long (long) months of nausea and “morning” sickness of the all day variety, I’m feeling more like myself again. I’m looking forward to seeing the bottom of this pile, and then some. I think I can do it before July 15, when the new housemate arrives. And at that point I can do another post about the things I’ve in the meantime started but not finished (ha).